Marc Washington’s Perspectives: Was culture of ancient Roman Empire African? The Roman Forum, formed in the 6th century BC, gave us the model for our Senate and governmental institutions. However, when discussing the foundation of Rome, never is an African (phenotype given to woolly hair & full facial features) origin considered. 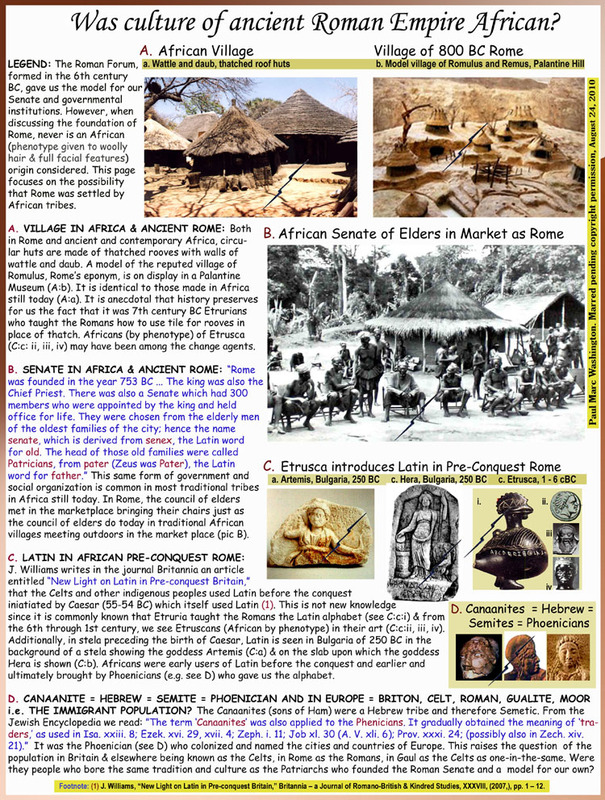 This page focuses on the possibility that Rome was settled by African tribes. A. VILLAGE IN AFRICA & ANCIENT ROME: Both in Rome and ancient and contemporary Africa, circular huts are made of thatched rooves with walls of wattle and daub. A model of the reputed village of Romulus, Rome’s eponym, is on display in a Palantine Museum (A:b). It is identical to those made in Africa still today (A:a). It is anecdotal that history preserves for us the fact that it was 7th century BC Etrurians who taught the Romans how to use tile for rooves in place of thatch. Africans (by phenotype) of Etrusca (C:c: ii, iii, iv) may have been among the change agents. B. SENATE IN AFRICA & ANCIENT ROME: “Rome was founded in the year 753 BC … The king was also the Chief Priest. There was also a Senate which had 300 members who were appointed by the king and held office for life. They were chosen from the elderly men of the oldest families of the city; hence the name senate, which is derived from senex, the Latin word for old. The head of those old families were called Patricians, from pater (Zeus was Pater), the Latin word for father.” This same form of government and social organization is common in most traditional tribes in Africa still today. In Rome, the council of elders met in the marketplace bringing their chairs just as the council of elders do today in traditional African villages meeting outdoors in the market place (pic B). C. LATIN IN AFRICAN PRE-CONQUEST ROME: J. Williams writes in the journal Britannia an article entitled “New Light on Latin in Pre-conquest Britain,” that the Celts and other indigenous peoples used Latin before the conquest iniatiated by Caesar (55-54 BC) which itself used Latin (1). This is not new knowledge since it is commonly known that Etruria taught the Romans the Latin alphabet (see C:c:i) & from the 6th through 1st century, we see Etruscans (African by phenotype) in their art (C:c:ii, iii, iv). Additionally, in stela preceding the birth of Caesar, Latin is seen in Bulgaria of 250 BC in the background of a stela showing the goddess Artemis (C:a) & on the slab upon which the goddess Hera is shown (C:b). Africans were early users of Latin before the conquest and earlier and ultimately brought by Phoenicians (e.g. see D) who gave us the alphabet. D. CANAANITE = HEBREW = SEMITE = PHOENICIAN AND IN EUROPE = BRITON, CELT, ROMAN, GUALITE, MOOR i.e. THE IMMIGRANT POPULATION? The Canaanites (sons of Ham) were a Hebrew tribe and therefore Semetic. From the Jewish Encyclopedia we read: ”The term ‘Canaanites’ was also applied to the Phenicians. It gradually obtained the meaning of ‘traders,’ as used in Isa. xxiii. 8; Ezek. xvi. 29, xvii. 4; Zeph. i. 11; Job xl. 30 (A. V. xli. 6); Prov. xxxi. 24; (possibly also in Zech. xiv. 21).” It was the Phoenician (see D) who colonized and named the cities and countries of Europe. This raises the question of the population in Britain & elsewhere being known as the Celts, in Rome as the Romans, in Gaul as the Celts as one-in-the-same. Were they people who bore the same tradition and culture as the Patriarchs who founded the Roman Senate and a model for our own? The Canaanites WERE NOT SHEMITES.. they descended from Kham/Cham/Ham NOT Shem HIS BROTHER.. they were not Hebrews. Hebrews descended from Eber a SON OF SHEM, NOT KHAM/HAM the Canaanites were of the same lineage as the other sons of Kham, ie Khemetians, Libyans, Phut, Ethiopia. Both Hamitic & Shemitic people were and still are BLACK. Many Hebrews ( Israelites & Ishmaelite) intermarried with Canaanites & Khamites. But they were never the SAME groups. When the Israelite patriarch Abram came into Canaan, he found a people whose language was similar to his.. this is where Hebrew a so called “Semitic” language comes from, but it does not change Canaanites into SHEMites. Nothing in paragraph D> establishes Canaanites as Hebrews. You should also be warned that using the writings of the so-called Jews, followers of the Pharisees religion ( not that given to Moshe- Moses) should not be used to establish truth. These people were not Hebrews/ Israelites according to Josephus. These are the same people who in their Talmud ( holiest book of Judaism) espouse the Curse of Ham.. they invented it after all!